As part of an initiative to get staff and visitors to use the stairs instead of the lifts at East Kootenay Regional Hospital, the green team came up with the idea of painting murals in the stairwells to make the surroundings more attractive. The local school was also involved in the initial murals by offering it as a class project for students. The paintings received a lot of positive feedback and helped increase traffic on the stairwells resulting in less use of the lifts and better health for those staff who decided to use the stairs. But researchers Theadora Swenson and Dr. Michael Siegel at Boston University decided to take the stairwell murals idea further by making it interactive. The stairwell at an Arizona health clinic was painted with a number of interactive activities to try to get the staff walking, rather than use the lift. One mural had a map on which people could write “where they were born, places they had visited, and their dream destinations,” as reported by Rich Barlow in BU Today. 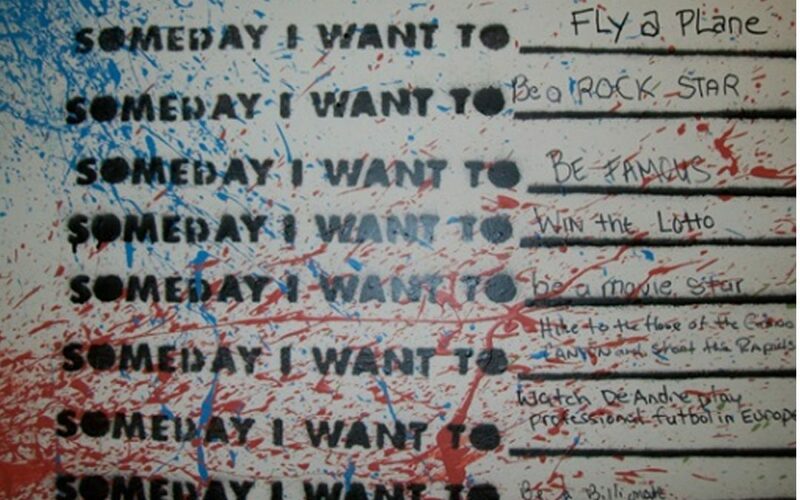 Another mural gave people the opportunity to write down their wish “Someday I want to …” While a further mural had a storyboard on which comments could be written. The results were impressive, with stair use more than doubling (from 31% to 66%) over the period. The initiative has also helped generate conversation and even formed bonds between people by revealing personal information that others didn’t know. When one day somebody wrote “Someday I want to be cancer-free,” not knowing who it was, others began writing messages of support. The results show that adding interactive components to wall murals can increase the use of stairs. Increasing Stair Use in an Office Worksite Through an Interactive Environmental Intervention. Theadora Swenson, Dr Michael Siegel. American Journal of Health Promotion, 27(5):323, 2013.